What was once a common sight over the Warwickshire countryside were the Varsities of 2 Air Navigation School based at Gaydon,the based closed in the 1970's and moved to Finningly. 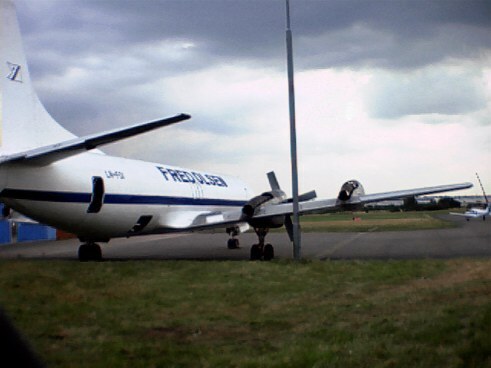 This aircraft is WF325/G and was ex J,the aircraft joined the Leuchers fire dump around 1971,the original G was WJ909 which was seen at Gaydon on 16.9.91 credit for this historic photograph goes to Dave Peace. 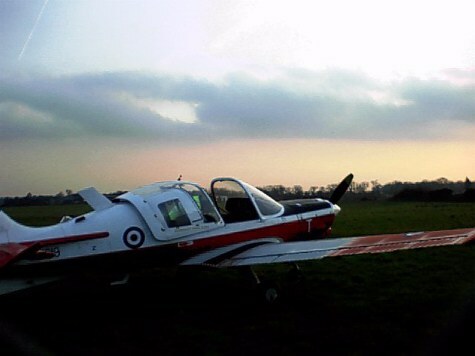 Now becoming a common sight over Warwickshire are the Grob 115E Tutor aircraft operated by the University Air Squadrons,this group here were taken at Cottesmore by Dave Peace on 24.7.2000. 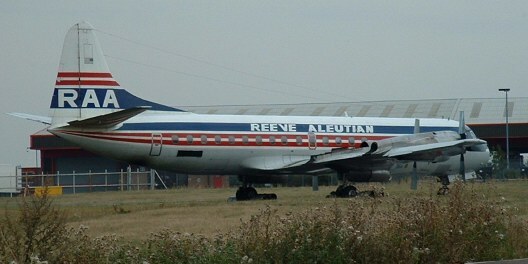 Reeve Aluthian Aircraft purchased by Atlantic Airways. Atlantic Airways have purchased the two Reeve Aluthian Electra aircraft which have been stored at Anchorage,the first aircraft to arrive was N9744C c/n 1140 which has been converted after its service with Western Airways to a model L188PF Freighter,delivered on 22-08-2002 and making a superb beat up of the airfield she was later moved into one of the hangars to be converted into G-LOFH its reserved registration,the other aircraft N178RV a passenger version was delivered on 05-09-2002 and will eventually appear as G-LOFI. Currently serving a useful role as an engine test bed for Allison engines is this Lockheed Electra that Air Atlantique have put to good use,the aircraft is the ex Fred Olsen LN-FOI,engines can be checked over,run and removed for other aircraft in the fleet. 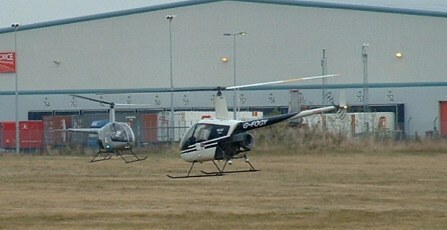 The Southside grass area at Baginton is widely used by the resident helicopter flying schools,here is G-FOGY and G-UNYT Robinson R-22's undergoing training for future helicopter pilots. 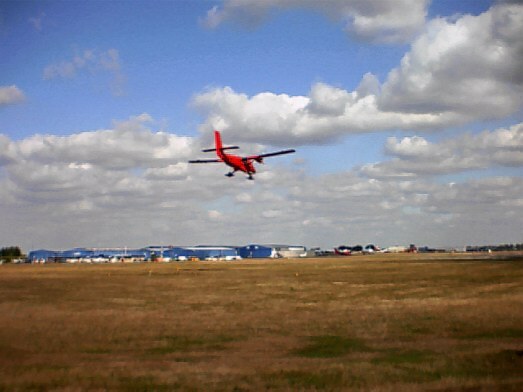 During August-September the British Antartic Survey aircraft were stored at Baginton,they became a regular and colourful sight when they conducted crew training in the area,aircraft involved were VP-FBB,VP-FBC,VP-FBL Twin Otters and Dash 7 VP-FBQ. Brantly B.2B vintage helicopters are getting rare in the UK,this one G-ASXD was ferried up from a farm in Devon for work to be undertaken by Heliair,it is shown here at Wellesbourne on 27-08-2002. 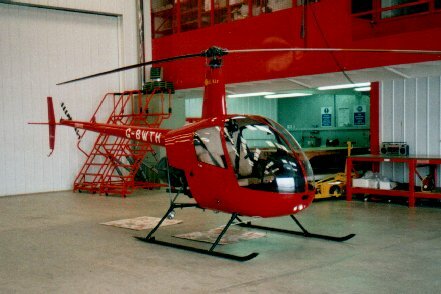 Passing through Wellesbourne on 11-05-2002 and staying for a few days was this MD600N G-BZTZ owned by Select Helicopters at Kintore in Scotland,it passed through Leeds for fuel. 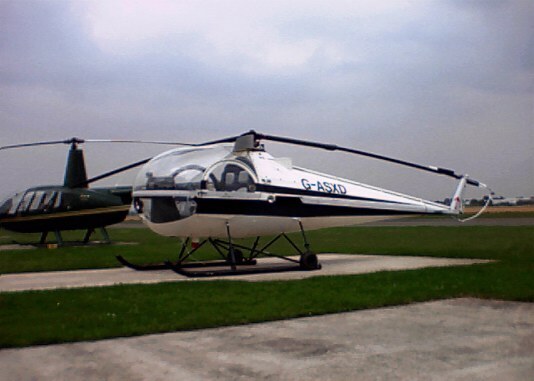 The helicopter was delivered recently from Shoreham to Kintore in company with N600SY which acted as a crew ferry. 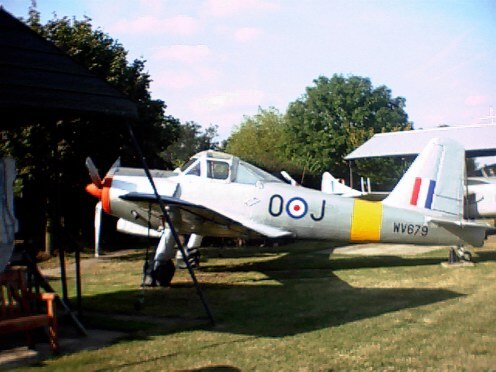 The aircraft in the background is Chipmunk G-BBMO which has recently been repainted in its former R.A.F colourscheme as WK514. 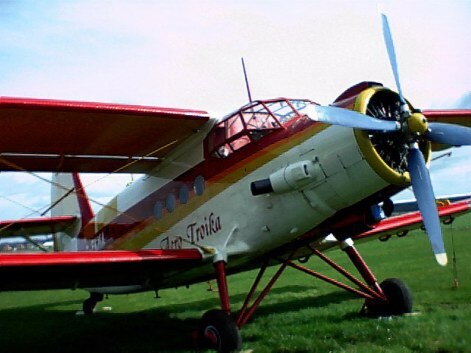 This delightful old Antonov AN-2 biplane D-FKMA is now based at Wellesbourne,photographed here on 21-03-2002 it shows to good advantage the rugged utility like nature of this machine,owned by a British European pilot it flies very occasionly,the aircraft actually served with the East German Air Force and flies in the colours of Aero Troika,the aircraft arrived via Filton from Toulose on 15-07-2001,very nice. Another view of the mighty Shestonov radial engine,most important to turn those cylinders over by hand by propping prior to starting her,this avoids hydraulic locks due to oil dripping to the lower cylinder. 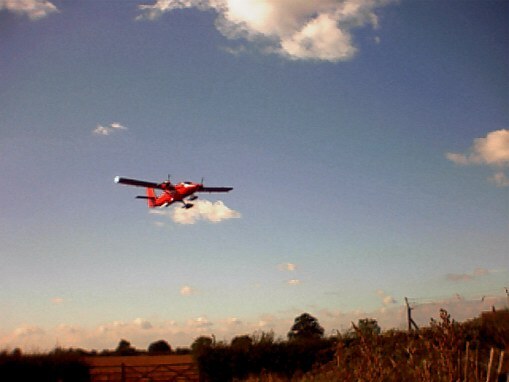 My thanks to Lee Palmer for allowing me to use his photograph of this LET 410 HA-LAQ based at Hinton-In-The Hedges airfield,used for parachuting at this delightful location. 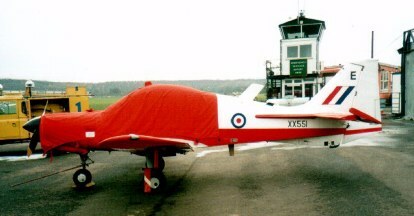 XT788/G-BMIR Wasp HAS.1 was on display outside the Tescos branch in Rugby during April 2002,it is trailered around the country by the Xray Tango Helicopter Club based at Dunkeswell in Devon. Another view of the Wasp at Rugby,its next port of call was to be Stratford On Avon. 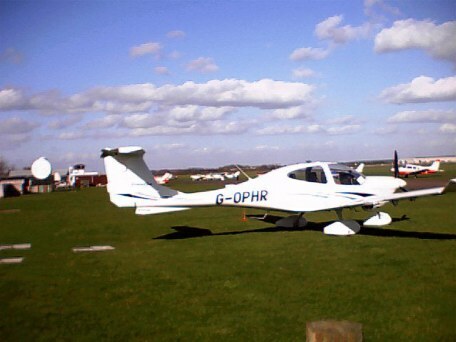 New shape in the Warwickshire skies is this beautifully finished Diamond D40 Star G-OPHR which spent a few days at Wellesbourne during March 2002. 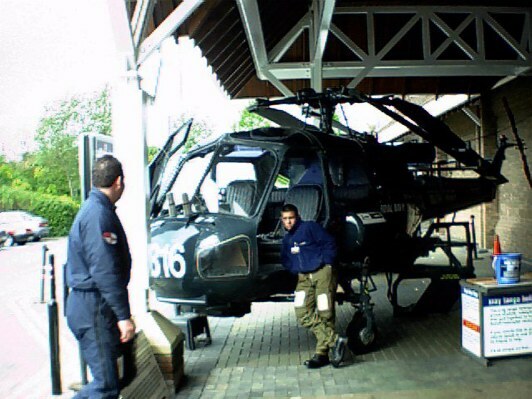 Busy as ever,Heliair were assembling this Jet Ranger from a newly delivered packing case during March 2002,still in big demand the Jet Ranger has seen sterling service all around the globe and a ready market exists here in the UK. lined up for more flying. Currently stored at Wellesbourne is this replica Spitfire which was used in the Battle Of Britain film,they were made from the moulds which were obtained from a full size genuine example. XX551/E c/n BH120/244 is now G-BZDP shown above outside on 2.12.2001. XX692 c/n BH120/341 became G-BZMH. 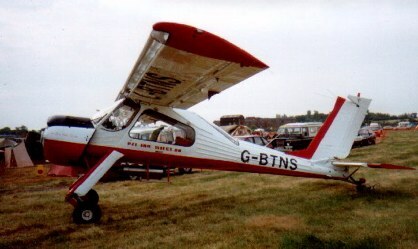 XX515/4 c/n BH120/201 became G-CBBC. 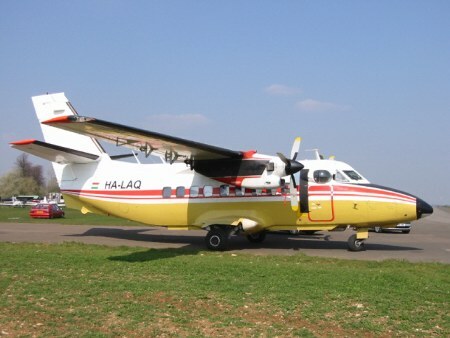 Two further aircraft have been used as a spares source,these are XX671/D c/n BH120/329 and XX634/T c/n BH120/304. Atmospheric shot of Baginton based XX619/T which has become G-CBBW seen here on 20.12.2001 with its proud owner who tells me that the aircraft consumes some 12 gallons of fuel per hour,the machine is proving to be a superb touring aircraft. Another as yet unidentified Bulldog is stored at Baginton in the Airpark hangars but is not yet airworthy. Very smart ZS-OGX South African registered PA-32R c/n 7780069 is now a new Wellesbourne resident. 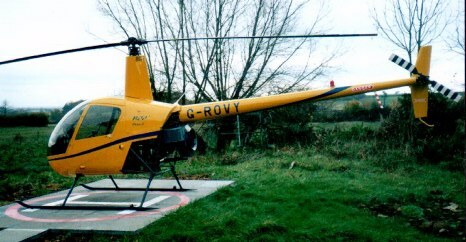 G-ROVY R-22 visited the heliport at Oxhill on 24.11.2001 from nearby Radway where its owner Richard Rice keeps the helicopter on his farm,at the weekends it is used to commute between here and a site at Shrewley. Now a familiar sight at Birmingham International are the aircraft of JMC Airlines Ltd,shown here is G-FCLE a Boeing 757-28A taken on 5.6.2001 by Dave Peace. Another regular visitor are the beautifully painted Airbus A330-243 aircraft of Emirates,this picture was taken at BHX on 5.6.2001 also by Dave Peace. 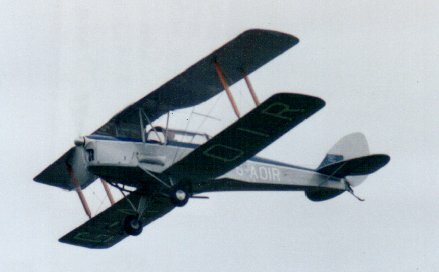 G-AGTM Rapide,intended for pleasure flying but unable to fly due to crosswind off limits. Other attractions included a splendid collection of Rolls Royce cars and Siddeley cars plus a display of static Viper engines. Baxterly,Charity Farm based Thruxton Jackaroo which dropped a parachutist over Warwick Castle 23rd June 2001,Ken Broomfield is the proud owner of this sole example now flying in the UK,many of the Tiger Moths so converted have been de-converted back to DH.82a standard making the breed very rare indeed. Thanks to Dave Peace for the picture. DHC.6-310 Twin Otters of the British Antartic Survey have frequented Baginton during September 2001 for open storage,here is VP-FBB together with VP-FBC visiting Old Warden on 6.8.2000 caught by Dave Peaces venerable roving camera. 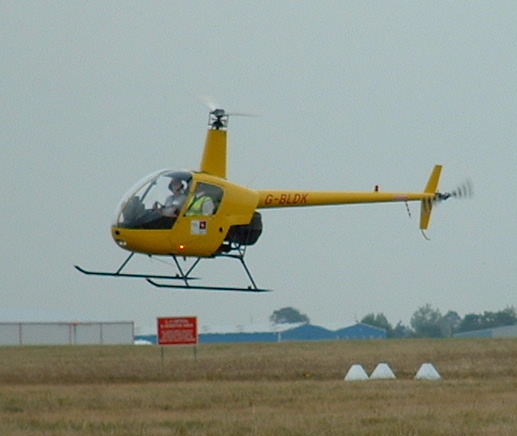 G-LOYD GAZELLE 1,DERBY-STAVERTON THROUGH BHX ZONE. G-BTYK CESSNA 310,JERSEY-MANCHESTER,THROUGH BHX ZONE. N19TW A.109,PRIVATE SITE OXFORD-P/SITE NE COVENTRY. N139DB PA.23,SHEFFIELD CITY-WHITE WALTHAM THROUGH BHX ZONE. EI-CFY CESSNA 172,THROUGH BHX ZONE. G-JCBI FALCON 2000,ILS RUNS BAGINTON. 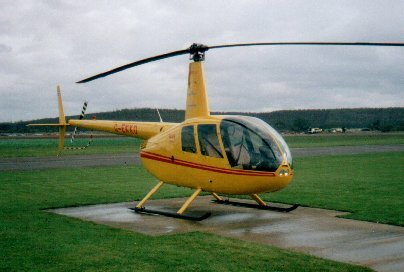 G-XXIV JET RANGER,PRIVATE SITE SHIPDHAM-WELLESBOURNE. G-BXDK BELL 412,THROUGH BHX ZONE. 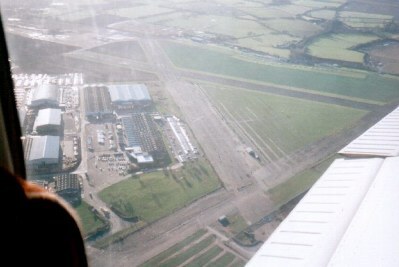 This view of Wellesbourne comes courtesy of Wellesbourne Aircraft Maintenance who kindly took me up to take the photograph myself,taken from Piper Warrior G-BTNE on 25.1.2001 it shows to good effect the typical wartime runway layout,herewith below I have prepared a runway and airfield layout. Operating hours of the airfield are from 0900 to 1800 daily however out of hours operations are normally accepted with prior notice,areas between runways are cultivated and visiting pilots are requested not to fly over Wellesbourne village. The Wellesbourne Aviation Group have a museum here with a Vulcan B.1 XA903 nose section which was once the ex Avro trials aircraft,blue steel trials and Rolls-Royce Olympus and RB.199 testbed,WV679/7615M Provost T.1,XJ575/SAH13 Sea Vixen nose section,XK590 Vampire T.11,and a redundant Yak 52 RA-01378 ex DOSAAF coded 14 which was donated to them,a feature of the museum is the underground bunker which has been painstakingly restored following the removal of gallons of water,the museum is open weekends but please check for current opening times. At point 'D' on the map you will see the location of the very successful Heliair organisation who are importers of the Robinson series of helicopters,they have a small car park where you can view the helicopter operations,like all of the organisations on the airfield they are a friendly bunch,please respect their car park. The complete Vulcan B.2A XM655/G-VULC is very occasionally given a run down the runway and is sometimes open to view,it can be found near the Galair training organisation. 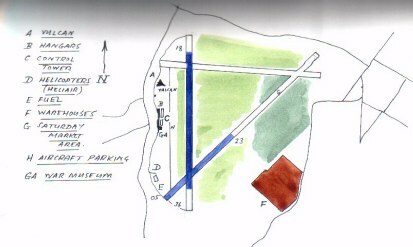 On Saturdays a large market is held on the eastern side of the airfield actualy using part of the old runway 23 which is used on occasions when the prevailing wind blows strong. 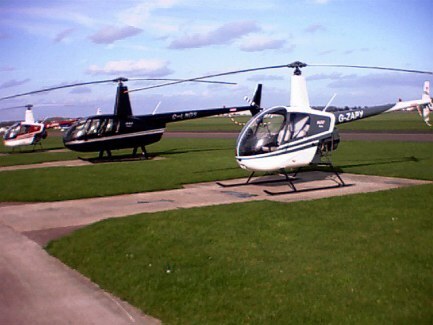 On the right is G-OBBY a brand new R.44, on the left is G-EKKO shown landing on 27.1.2001 from its base at Enterprise House,Hampton-In-Arden the helicopter is no more as it was written off at Wellesbourne on 2.9.2001,see details further on. 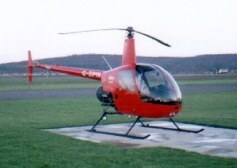 G-SIMN R-22 has been used both at Wellesbourne and Baginton during 2001-02 for training. Pictured here at Wellesbourne on 27-01-2001. D.M.Squires Wellesbourne based Chipmunk 22 G-BBMO,one of many such aircraft that have been based here over the years,the aircraft looks most attractive in its all training yellow colourscheme and is part of the 'Squires Air Force',photograph by Dave Peace. Earlier colourscheme used on Ken Broomfields Charity Farm strip based Thruxton Jackaroo G-AOIR,the aircraft was converted from a Tiger Moth aircraft R4972 and is a rare bird these days as most of the breed have been re-converted back into Tiger Moths leaving only two examples of the type flying in the UK.photographed at the PFA Rally in 1986 by Barry Clay. N2548T RYAN NAVION RANGEMASTER,BIRMINGHAM,FROM GUERNSEY,A RARE AIRCRAFT IN EUROPE. G-BYET CESSNA 172P FROM YATE-THROUGH BHX ZONE. G-AZVM HUGHES 368HS SOUTHAM SITE-CORLEY SITE. G-TOYZ JET RANGER BLACKPOOL-BAGINTON THEN TO HALFPENNY GREEN. G-ALXZ AUSTER 5-150 (LYCOMING 0-320) THROUGH BHX ZONE. Interesting visitor to Baginton on 18.2.2001 was this Platinum Air 2000 J.31 Jetstream G-PLAH,photographed in the misty conditions that day. Platinum Air have now ceased trading and the aircraft last seen parked at Blackpool. G-SVIP Golden Eagle,G-RCMC Renegade Spirit,G-JIMB Pup,G-YAKA Yak 50,N184CD Cirrus Sr.20,G-BTSZ Cessna 177 (ex N30332 on fin),N23360 Cessna 170,N45AW PA.28 Arrow IV,RA44533 Yak 50,with Mick Allen & Son Resprays were RA44473 Yak 52 and RA02090/10 Yak 50. My thanks to Dave Peace for this report on Turweston. 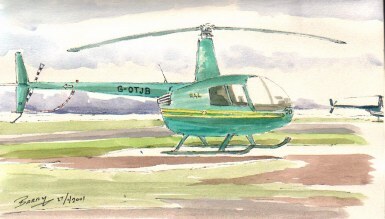 G-BXVK ROBIN HR.200 SYWELL-HALFPENNY GREEN. G-VMJM TB.10 TOBAGO ENSTONE-TOUCH AND GO AT WELLESBOURNE THEN TO SYWELL. G-DCSE R.44 BROADWAY-SITE NEAR NORTHANTS. G-WHST AS.350B2 ISLE OF DOGS-BELFRY. G-KKES TB.20,ALDERNEY-LEEDS BRADFORD THROUGH BHX ZONE. G-TPSL CESSNA SKYLANE,THROUGH BHX ZONE. G-ANAF RACAL DAKOTA,FLYING WITH NEW TAIL FILLET BELOW FUSELAGE,NOTED LEAMINGTON,WARWICK,EVESHAM AREAS. 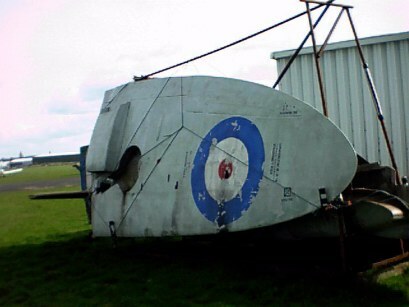 G-WARS PA.28,LONDON SCHOOL OF FLYING,WELLESBOURNE. 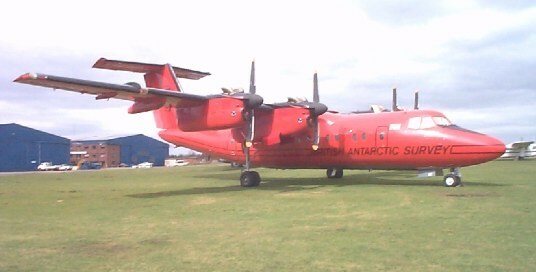 G-DCSE R.44,SITE AT BUCKLAND BROADWAY-WELLESBOURNE. N7148R BEECH 55,BAGINTON,TO AEROTECH FOR MAINTENANCE,AIR SERVICES HOLDING CORP.
G-WHDP CESSNA 182S,THROUGH BHX ZONE. N425RR ROCKWELL 690A AEROCOMMANDER,BAGINTON,RAMI AVIATION INC TRUSTEE. G-BSYU ROBIN R2160 ACRO SPORT,HINTON-WELLESBOURNE. 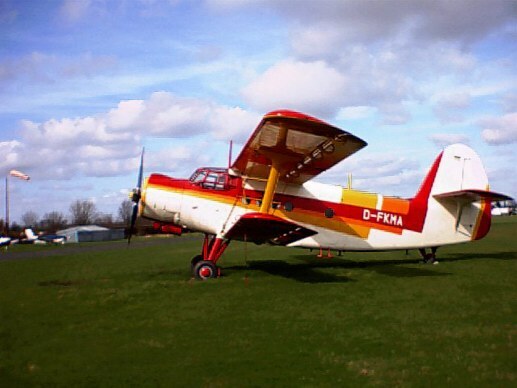 G-BRKO OLDFIELD BABY GREAT LAKES,WELLESBOURNE. G-BIUV HS.748 SRS 2A,BAGINTON,EMERALD AIRWAYS. ZJ273 SQUIRREL HT.1 (AS.350BB),ABEAM BAGINTON FROM SHAWBURY LOW LEVEL. G-BXER PA.46 MALIBU MIRAGE,OXFORD-BLACKPOOL THROUGH BHX ZONE. G-BZKD STOLP SA.300 STARDUSTER,EX N70DM,BEING ASSEMBLED IN HANGAR,ROADED IN FROM BELGIUM. 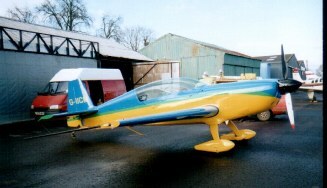 THE AIRCRAFT IS OWNED BY C AND P EDMUNDS FROM WELLESBOURNE. XZ587 SEA KING HAR.3,LOW LEVEL ABEAM BAGINTON. G-MLTY LIFTING OFF FOR HUDDERSFIELD. G-EGUL CHRISTEN EAGLE II,WELLESBOURNE-BRIZE NORTON. G-RAMI JET RANGER III,OXFORD PRIVATE SITE-DAVENTRY PRIVATE SITE. G-HARH S.76B,AIR HARRODS LTD,PRIVATE SITE SOUTHEND-PRIVATE SITE MANCHESTER,THROUGH BHX ZONE. G-BXCB A.109A-II,CASTLE AIR CHARTERS,THROUGH BHZ ZONE. G-SAAB RC.112,FAIROAKS-? THROUGH BHX ZONE. G-ATBW TIPSY NIPPER 2,STAPLEFORD TAWNY-WELLESBOURNE. G-BNPH/WV740 PEMBROKE C.1,ILS RUNS BAGINTON,JERSEY BASED. N822MC HUGHES 500E,ODIHAM PRIVATE SITE-BLACKPOOL PRIVATE SITE,THROUGH BHX ZONE. VP-FBQ DHC.DASH 8,FAIROAKS/FARNBOROUGH-BAGINTON FOR OPEN SUMMER STORAGE,BRITISH ANTARTIC SURVEY. Picture courtesy of Ewen Taylor,Fleet 80uk. Picture shows ES-NOC one of three Antonovs now appearing on frequent visits to Baginton,my thanks to Ewen Taylor for providing this photograph. 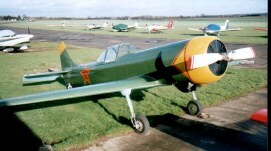 N709AT A.109,BAGINTON,FROM SYWELL TO LE BOURGET. 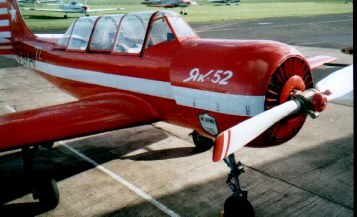 G-BUGV T.61F VENTURE 2,WELLESBOURNE,FROM SHOBDON. XV211 C-130,R.A.F CREW TRAINING BAGINTON,TO LEEMING. G-BSDU JET RANGER,DRAYCOTT WATER TO DROITWICH HELIPORT. 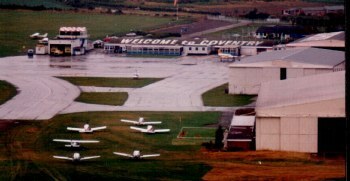 Coventry (Baginton) Airport from the air taken in 1986 from the Fuji Airship,if anyone has a more recent photograph than this then I will be pleased to hear from them as considerable changes to the apron have now taken place.Messages can be left in the guest book on the WORLD AVIATION page. G-BPYR PA-31,LEICESTER-BAGINTON FOR ILS RUNS. G-PROD SQUIRREL,PRODRIVE BANBURY SITE-MIRA TESTING GROUNDS. G-AZVM HUGHES 369S,TO PRIVATE SITE NEAR CORLEY SERVICES. G-BTIS SQUIRREL,PHOTOGRAPHIC WORK OVER BANBURY AREA. G-DOOZ SQUIRREL 2,THROUGH BHX ZONE. 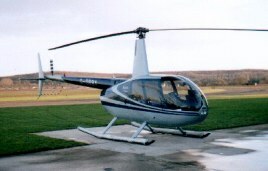 G-BZEI AGUSTA A.109,PRIVATE SITE AT SWINDON-P/SITE WIGAN. N4422P PA-23-160 GARION (APACHE CONVERSION) LITTLE STAUGHTON-BHX IN CONNECTION WITH YAK 18T RA81584. G-BAGB SIA MARCHETTI SF260,BRITISH MIDLAND AIRWAYS,THROUGH THE BHX ZONE. G-IZZS CESSNA 182 DIVERSION WELLESBOURNE DUE TO WINDSHEAR. 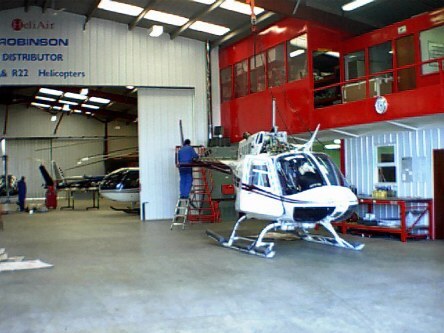 G-OFIL R-44,PRIVATE SITE 5 MILES SOUTH GLOUCESTER-STRATFORD SITE. N6107Y RC114,TAMBOTI AVIATION INC TRUSTEE,BAGINTON. G-OVBJ JET RANGER III,AEROMEGA PIPELINE PATROL EVERY WEDNESDAY,LOW LEVEL BETWEEN SOLIHULL,CHURCH LAWFORD,THEN TO SILVERSTONE SOMETIMES LANDING AT BAGINTON. N40386 BASSLER BT67 TURBO DAKOTA CONVERSION,BAGINTON,TO OSHKOSH USA NEXT DAY. N818Y PA-30,TWO DAY VISIT TO BAGINTON. 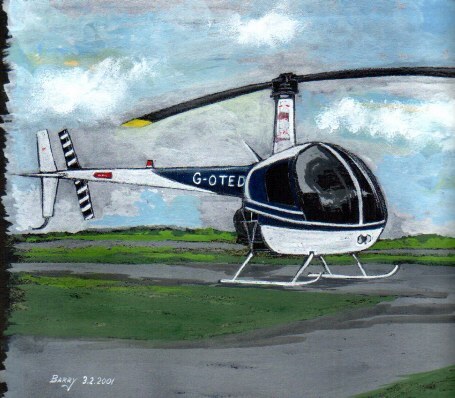 G-BTDI R-22,BAGINTON,INTO SPACE LTD,NOW SOLD IN THE NETEHRLANDS. G-BPRI SQUIRREL,RAILWAY LINE PATROL COVENTRY AREA. N176AF CITATION 650,GENERAL AIRCRAFT FINANCE CORP,OPERATED BY AIR ATLANTIQUE,BAGINTON. G-BZEI A.109,PRIVATE SITE BICESTER-P/SITE WALSALL. G-JETZ JET RANGER,ELSTREE-SITE NEAR TERNHILL CALLING FOR FUEL AT WELLESBOURNE. G-FLPA BEECH A200,CALIBRATIOIN AIRCRAFT,NUMEROUS RUNS ACROSS WARWICKSHIRE THEN LANDED BHX. 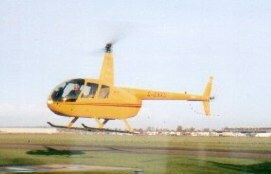 N115VC R44 CLIPPER (FLOAT EQUIPPED VERSION) WELLESBOURNE,NORMALLY BASED IN GREECE. N92562 AA5,TO BLACKPOOL THROUGH BHX ZONE. G-BZEI A.109,PRIVATE SITE WIGAN-P/SITE WITHIN HEATHROW ZONE. G-WARP CESSNA 182,ARMY PARACHUTE ASSOCIATION,NETHERAVON-SOUTH CERNEY. G-BIUV HS.748 SRS 2A,EMERALD AIRWAYS,BAGINTON. was ex LN-SUD and became 9L-LAL with the Sierra Leone Selection Trust,it was rebuilt in March 1968 for Emerald and eventually sold in September 1976 as ZK-EJM. This much travelled aircraft was the very prototype of the Heron series and was virtually a modified Dove with pieces added to make it into the Heron prototype,initially sold to Jersey Airlines it served with a Japanese company for a while and became LN-BDH in April 1954,overhauled by Executive Air Engineering in January 1967 it joined Sudflug as OY-DGS until joining Emerald Airways for a short while,the eventual fate of this aircraft is that it was the subject of a legal wrangle in Australia and still lies derelict there,plans to bring it back to the UK to be looked after by The Shuttleworth Trust did not materialise and this historic aircraft will rot away. G-BTXG JETSTREAM,HIGHLAND AIRWAYS,ABERDEEN,OPERATED BY AIR ATLANTIQUE AND ON MAINTENANCE THIS DATE IN HANGAR. G-RICE R-22 LIFTED FROM OWNERS SITE AT DRAYCOTT THEN TO BAGINTON. G-ONPA NAVAJO,TO HURN IN COMPANY WITH G-OBNA THROUGH BHX ZONE. 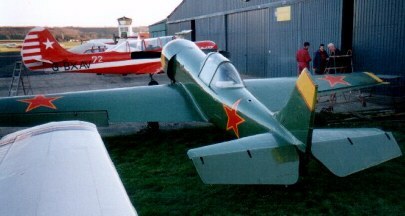 G-BWYO FRATI KIT BUILT FALCO F8L,BAGINTON. 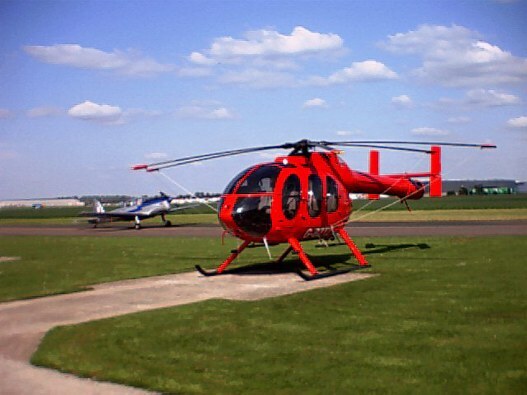 G-SOHI AGUSTA A.109,ELSTREE-BAGINTON,TRI VENTURES GROUP. 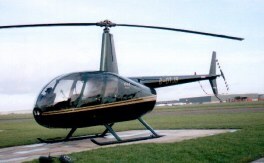 G-FORS CAUGHT AT TURWESTON BY DAVE PEACE ON 20.2.2000. G-BZMO R-22,THROUGH BHX ZONE, TO? G-MIND CESSNA 404,TO BLACKPOOL FOR CIRCUITS FROM BAGINTON. G-BZMG R-44,RAMSGILL AVIATION,THROUGH BHX ZONE. HB-VJI LEARJET 31,BAGINTON (EX N3803G). G-VROE AVRO 19,TEST FLYING BAGINTON. G-SKYO SLINGSBY T-67M,BODMIN-GRANBY NORTH YORKS. G-IICM EXTRA 300L,'CHARLIE MACAW II' HAWARDEN-WELLESBOURNE,LOCAL FLYING ALL DAY. 9L-LCD LET 410,BRUNTINGTHORPE-WELLESBOURNE FOR CREW TRAINING. 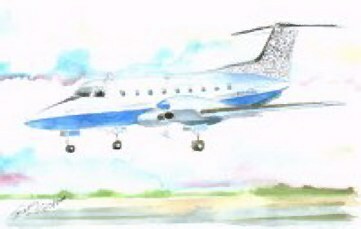 Sketch by Barry Clay of the aircraft seen making an approach in blustery conditions at Wellesbourne on 25.1.2001. 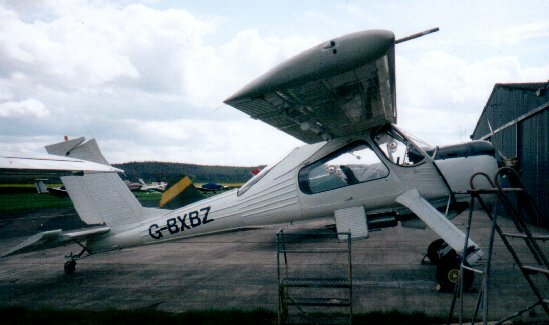 The two LET 410UVP aircraft were imported in September and December 1999 via Stapleford and eventually turning up at Bruntingthorp[e airfield for open storage,C5-LES c/n 810611 is ex UR67010 and C5-LET c/n 831036 is ex UR67408,known as the Turbolet they are a rare bird in the UK. 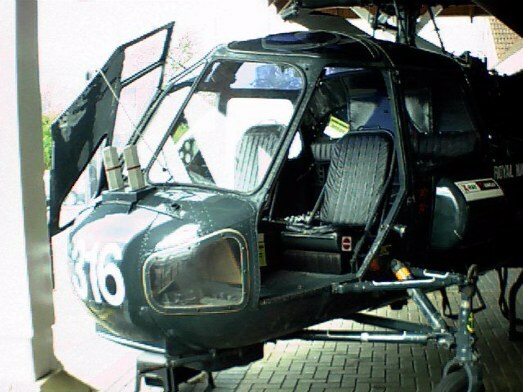 this photograph was taken at Bruntingthorpe on 29.10.2000 by Dave Peace. G-BZMH BULLDOG T.2 CODED 'A' EX BRISTOL UNIVERSITY AIR SQUADRON/3 AIR EXPERIENCE FLIGHT WAS BASED AT COLERNE,FERRIED TO RAF NEWTON FOR STORAGE (NOTED THERE ON 29.3.2000) SOLD AT PHILLIPS AUCTION TO NEW OWNERS AT HARBOURNE,BIRMINGHAM,THE BLACK AND YELLOW FIN TIP IS THE MARKINGS OF BRISTOL UNIVERSITY AIR SQUADRON. G-BZMH/XX692 BULLDOG SRS 120,WELLESBOURNE,FOR CONVERSION. G-AOFS AUSTER J/5L AIGLET TRAINER IS EX EI-ALN ON THE IRISH CIVIL REGISTER,ITS CONDITION IS IMMACULATE. 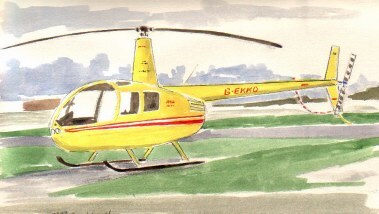 G-OTJB R-44 of Heliair sketched on 27.1.2001 at Wellesbourne. Convair 440 CS-TML seen here in its short lived Atlantic Airlines livery which was later changed to Agroar Cargo due to Portuguese civil aviation rules,both pictures were taken on 21.5.2000 at Coventry,the aircraft has recently undergone an engine change and been seen compass swinging.History is delivered 29.7.59 to Mohawk Airlines as N4402 with c/n 484,it is also ex N357SA,N28KE,N28KA,N4402. with thanks to Dave Peace for the use of these photographs. 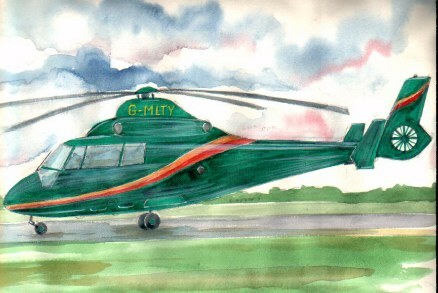 G-POAH SIKORSKY S-76B,BATTERSEA-SOUTHAMPTON DOCKS,P&O AVIATION. G-BXTP DIAMOND KATANA DA20-A1,THROUGH BHX ZONE. N184CD CIRRUS SR20,THROUGH BHX ZONE. 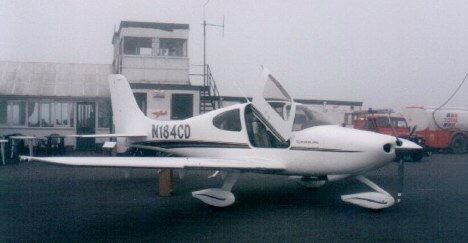 Photographed on a gloomy day at Turweston on 18.2.2001 by Dave Peace is this Cirrus N184CD which has been very active in the area of late. PH-BRL EMBRAER EMB-120RT,BUSINESS AVIATION SERVICE,EINDHOVEN-BAGINTON. G-BXXV EUROCOPTER EC-135T-1,TRANSITTING BHX ZONE,EXTERNAL NOSE CAMERA. 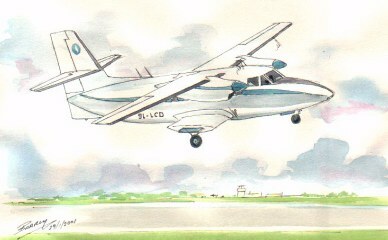 PH-BRL from a painting by Barry Clay landing at Baginton.